The crown of Faustin I is the crown of Faustin-Élie Soulouque, who ruled as President of Haiti from 1847 to 1849 and as Emperor Faustin I of Haiti from 1849 to 1859. The crown is decorated with emeralds, diamonds, garnets, and other jewels. It had been exhibited in the Musée du Panthéon National Haïtien (MUPANAH). However, it was found that some jewels on the crown were stolen at some unknown time. Due to the vandalism it suffered, the crown was transferred, under high surveillance, to a safe place for protection on January 31, 2007. ^ "La couronne de Faustin 1er vandalisée". Le Nouvelliste en Haiti. January 31, 2007. Archived from the original on July 13, 2011. Faustin-Élie Soulouque was a Haitian politician and military commander who served as President of Haiti from 1847 to 1849 and Emperor of Haiti from 1849 to 1859. The flag of Haiti is a bicolour flag featuring two horizontal bands coloured blue and red, defaced by a white panel bearing the coat of arms. The coat of arms depicts a trophy of weapons atop a green hill, ready to defend freedom, and a royal palm symbolizing independence. The palm is topped by the Cap of Liberty. The motto L'Union Fait La Force appears on a white ribbon below the arrangement. The Dominican Independence War gave the Dominican Republic autonomy from Haiti on February 27, 1844. Before the war, the island of Hispaniola had been united under the Haitian government for a period of 22 years when the newly independent nation, previously known as the Captaincy General of Santo Domingo, was unified with Haiti in 1822. The criollo class within the country overthrew the Spanish crown in 1821 before unifying with Haiti a year later. Gonâve Island is an island of Haiti located west-northwest of Port-au-Prince in the Gulf of Gonâve. It is the largest of the Hispaniolan satellite islands. The island is an arrondissement in the Ouest and includes the communes of Anse-à-Galets and Pointe-à-Raquette. The indigenous Taínos called the island Guanabo. 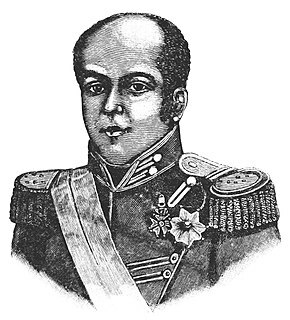 Jean-Baptiste Riché was a career officer and general in the Haitian Army. He was made President of Haiti on March 1, 1846. Petit-Goâve is a coastal commune in the Léogâne Arrondissement in the Ouest department of Haiti. 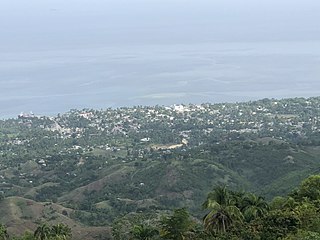 It is located 68 kilometres (42 mi) southwest of Port-au-Prince. The town has a population of approximately 12,000 inhabitants. The coat of arms of Haiti was originally introduced in 1807, and has appeared in its current form since 1986. The First Empire of Haiti was an elective monarchy in North America. 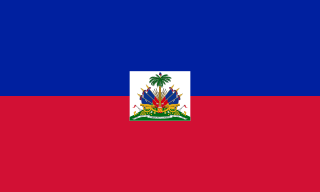 Haiti was controlled by France before declaring independence on January 1, 1804. The Governor-General of Haiti, Jean-Jacques Dessalines, created the empire on September 22, 1804. Proclaiming himself Emperor Jacques I, he held his coronation ceremony on October 6. The constitution of May 20, 1805, set out the way the empire was to be governed, with the country split into six military divisions. The general of each division corresponded directly with the emperor or the general in chief appointed by the emperor. The constitution also set out the succession to the throne, with the crown being elective and the reigning emperor having the power to appoint his successor. The constitution also banned white people, with the exception of naturalised Germans and Poles, from owning property inside the empire. Nadine Faustin-Parker is a Haitian hurdler born in Brussels, Belgium. She has represented Haiti at three Summer Olympics;. The Battle of El Número, was a major battle during the years after the Dominican War of Independence and was fought on the 17 April 1849, nearby Azua de Compostela, Azua Province. A force of 300 Dominican troops, a portion of the Army of the South, led by General Francisco Domínguez, encountered an outnumbering force of 10,000 troops of the Haitian Army led by General Jean Francois Jeannot. Haiti sent a delegation to compete in the 2008 Summer Olympics, held in Beijing, People's Republic of China, from August 8 to August 24, 2008. Its participation in Beijing marked its seventh consecutive appearance at the summer Olympics and its fourteenth appearance overall, with its first being at the 1900 Summer Olympics in Paris. The Haitian Olympic team included seven athletes participating in track and field, boxing, and judo. More women participated for Haiti in 2008 than at any single Olympic games prior. Although Pierre and Dorival advanced to quarterfinals in their events, there were no Haitian medalists in Beijing. Brutus carried his country's flag at the ceremonies. Adélina Soulouque, née Elisabeth Anne Justine Lévêque, was Empress Consort of Haiti from 1849 until 1859, as wife of Faustin I of Haiti. The Second Haitian Empire, officially known as the Empire of Haiti, was a state which existed from 1849 to 1859. It was established by the then-President, former Lieutenant General and Supreme Commander of the Presidential Guards under President Riché, Faustin Soulouque, who, inspired by Napoleon I, declared himself Emperor Faustin I of Haiti on August 26, 1849 at the Cathedral of Our Lady of the Assumption in Port-au-Prince. Faustin's unsuccessful invasions in an attempt to reconquer the Dominican Republic, which seceded from Haiti in 1844, undermined his control over the country. 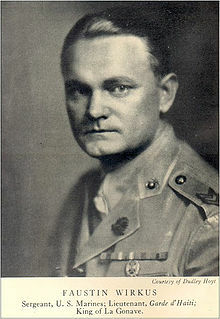 Faustin Edmond Wirkus was a Polish-American U.S. Marine stationed in Haiti during the United States occupation of Haiti (1915-1934). He was reputedly crowned Faustin II, King of La Gonâve, a Haitian island west of Hispaniola, on 18 July 1926, and ruled until he was transferred by the United States Marine Corps to the United States mainland in 1929. Olive Soulouque, Princess Imperial of Haiti was the eldest daughter of Emperor Faustin I of Haiti and Adélina Lévêque.